Prostate Research Labs, today announced that their market leading prostate health formula, Prost-P10x®, remains the strongest natural formula available to men looking to support their treatment for prostatitis and CPPS (Chronic Pelvic Pain Syndrome). Prostatitis is a debilitating disorder that strikes up to 20% of men in the USA and is the 2nd leading cause of visits to a Urologist by men. Non-bacterial prostatitis is generally untreatable with traditional antibiotics and men are left to look for their own solutions to support prostate health that includes supplements and other non-traditional therapies like acupuncture and pelvic massage. Prost-P10x® contains over 3320mg in a daily dose packet containing 12 active ingredients in professional strength dosages. This is over 5x the ingredients and daily dosage usually found in other prostate supplements. Importantly, the Prost-P10x® formula contains standardized Graminex™ Pollen and Meriva™ Curcumin as well as Quercetin and 9 other active ingredients not found in any other prostate formula in the Prost-P10x™ combination and strength. These are the direct active ingredients that have been shown in the clinical studies to promote prostate health in men struggling with chronic pelvic pain syndrome (CPPS). The Prost-P10x® formula was developed by Dr. Geo Espinosa. ND at NYU Department of Integrative Urology specifically for use with his patients. Dr. Geo specializes 100% in men’s prostate disorders and is the most recognized naturopathic doctor in the USA for prostatitis, CPPS, BPH and prostate cancer treatment. Prost-P10x® is also 100% made in the USA. 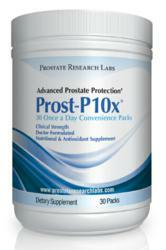 CPPS patients looking to use the Prost-P10x® formula to help support their prostate health can use discount code “CPPS” for an additional 10% off their purchase at the official Prost-P10x® website http://www.prostateresearchlabs.com.